Hello again! Dawn here, from AD Aesthetic, and I’m back with another mood board for your decoration inspiration. Spring is just around the corner, so I’ve had bright, fresh spaces on my mind lately. I don’t have much of a laundry room at my house (more like a closet) but I always feel like that is one space where organization and decor can really make a big difference in the energy of the room, and the brightness of your mood. Typically, a laundry room isn’t a place where you want to spend much time. Personally, laundry is one of my least favorite chores. That being said, a dark, depressing space may not be the best option for making a dreaded chore any more enjoyable. Instead, creating a space that feels light and airy may just get you through laundry day with minimal angst. For this space, I chose a fairly neutral color palette with creams, whites, natural browns, and blues. Texture, but not too much. It’s difficult to pull off a farmhouse vibe without incorporating texture, but in this case, leaning more towards the modern side of the modern farmhouse look may be the way to go. For a laundry room in particular, surfaces with a lot of texture can be difficult to keep clean, and no one wants to wash clothes in a space that is filled with chippy paint or rust. Speaking of clean, I’m a firm believer that a clean space is easier to keep clean. That is to say, having a dedicated space for everything, and keeping everything in it’s place, makes keeping things clean much easier, and a clean laundry room is a happy laundry room. (Or any room for that matter.) As I said above, no one wants to have their newly cleaned clothes in a space that feels dirty, and cluttered almost always feels dirty. Having lots of storage is one way to combat this. 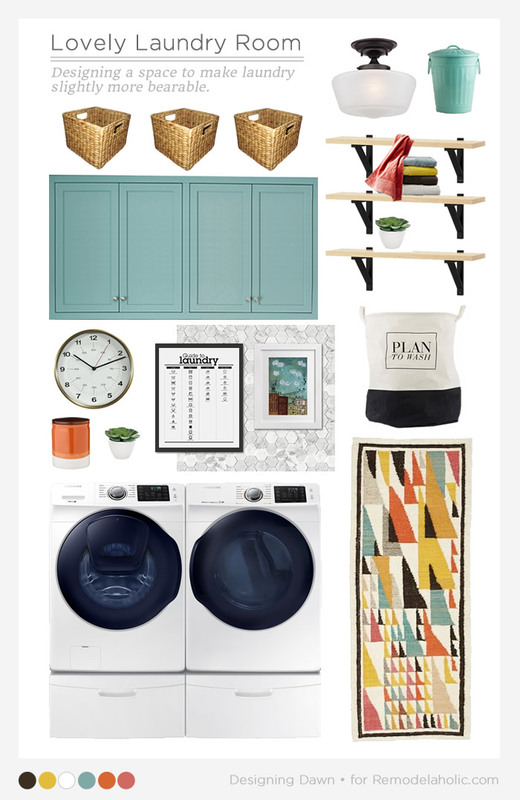 In the moodboard above, I incorporated storage with lots of open shelving, but also with closed laundry storage to keep offending items out of site. rustic industrial laundry room mini makeover 100+ beautiful laundry rooms — including small laundry rooms and laundry closets! Thanks for the inspiration, Dawn! I completely agree with you that organization and decor make a huge difference in the laundry room. I swapped out ugly dark shelves for light open ones in my laundry space, and it’s like a whole new room! (I still try to spend as little time in there as possible.) I also put a plant on one of the shelves, and I absolutely love the new vibe. Why shouldn’t you have a pretty laundry room?